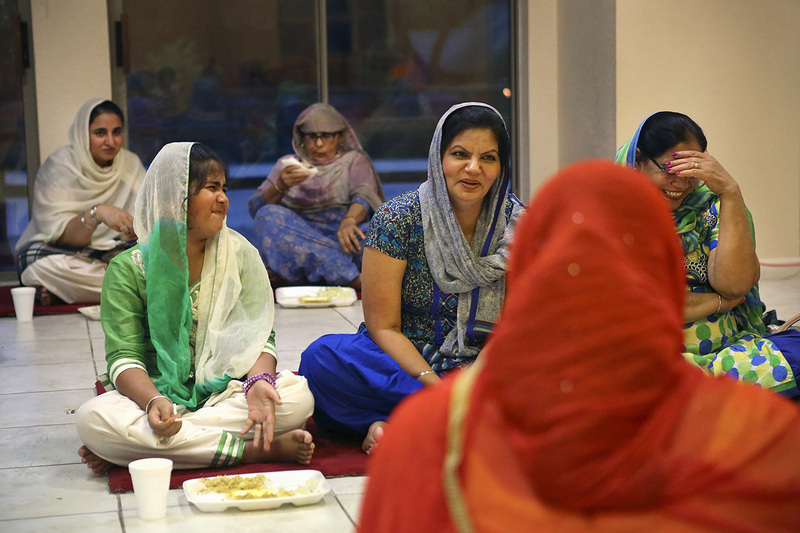 From left, Gurjot Kaur, 8, Kulwinder Kaur and Kaulwant Kaur laugh while eating after the evening service on Saturday, June 28, 2014, at the Sikh Center of San Antonio. Food is offered after daily services, as well as throughout the day, in the center’s langar hall to anyone who wants it. The langer, or communal kitchen, is a symbol of equality, serving people of any religion or social class. The Sikh Center of San Antonio opened in 2001 and has since seen the Sikh community in San Antonio increase dramatically, from about 150-200 Sikhs then to 400-500 now. Most Sikhs are from the Punjab region in northern India, where the religion originated.